A western wildlife and landscape artist, Bodily is a resident of Montana. He was the winner of the 1986 Ellensburg Washington Rodeo Association Poster Award, and recently received Best of Show/Flatwork at the Florence Festival Art Auction in Florence, Montana. 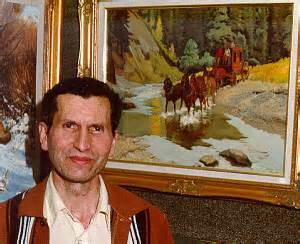 Favorite subjects rendered in oil and pencil include Indian scenes with children, old cabins, wagon trains and wildlife. He is widely exhibited in Sante Fe and Taos, New Mexico, Sedona, Arizona and Idaho.